Southern Living: Dentists with Living Rooms ROCK! Dentists with Living Rooms ROCK! 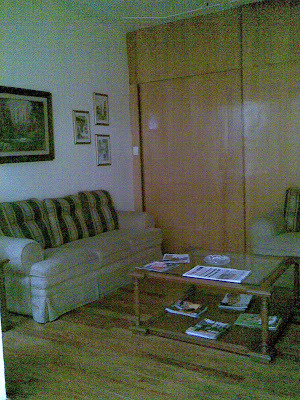 No, that's not a picture of my living room, but rather, a picture of my dentist's living room/office space. Homey, isn't it?? Well, I finally got around to seeing the dentist, and thanks to everyone in DF who assisted me in my search. Joy linked me to a great list from the Embassy website, which others might find useful. After I made my appointment, the dentist himself rang me to introduce himself and get to know me. I was a little taken aback and maybe rude to him for asking me personal questions without ever having met me, but I suppose that was the point of the conversation. The dentist usually has an assistant working nearby to suction, spray water, mop up stray drool, etc., but this dentist did not. He had an assistant, but she didn't act as the suctioner/mopper. He had THE TOWEL! Let me just tell you that a towel under the chin still leaves the chin and part of the neck a perfect conduit for drool to flow out your mouth and down your face. It wasn't too bad, I guess, just messy and unexpectedly wet. Hi! I just found your blog and I've enjoyed reading it! I prefer the dentists here in Mexico rather than the ones in the States. The "service" just seems so much more personal. I have the added plus that my dentist is also my brother-in-law!!! Welcome! For some reason, I had a very scary idea of what was going to happen, and it turned out to be more than pleasant. Next up, the doctor! I've been looking through your blog and intrigued with your experiences. I'm from New York; I married a Mexican in 1994, left in 1998 and returned in 2010. Things have changed a great deal in this country, sadly for the worse. What I've discovered though is there is seems to be a tendency in Mexicans to treat foreigners better than they treat each other. I am of Latino (Puertorican parents) descent and speak Spanish fluently. A neighbor was stealing my electricity, and a business I was operating with my wife here in the Southern end of the city due to false accusations by another "neighbor". I won't even get into the legal hassles of dealing with lawyers and government officials. We had a guy from the PRD who promised to help us resolve the issue while he was running for office in Coyoacan. The jerk got elected and forgot about us completely. I got an unsolicited call for an interview offering a purchasing position at Opticas Lux. The HR girl told they wanted to see me the following day. I got a call later asking my nationality to which I answered American; she canceled the interview and asked that I would get another call the next day. The call came and was asked again if I was American, and never got a call from them again. I never really understood what happened, but the impression I was given that the determining factor was being American. It only confirmed the xenophobic behavior I had begun to detect after living and interacting with folks from given parts of the city. More power to your stay in Mexico and I hope you get to make it to other parts of Latin America. Me, I want to get back to New York; I've had too much of this BS. It started well, but the party is over. I hear you on the BS. At times I get overwhelmed with it, but overall, I've been very happy here. I like that people complain less, are more laid back, generally happier despite having less wealth, and have better work/life balance. Everyone has a different experience, and I'm not sure my experience is any better because they treat me better as a foreigner. But it's hard to say since I'm not a local and am not fluent in Spanish.